WHY OUR PIANOS ARE SIMPLY BETTER! Save 50--80% Off Retail Everyday! Description: Rud Ibach Sohn is the oldest piano company in the world still making pianos since 1794. Rarer still, the company is in the hands of the original family with the 7th generation involved and involved in all stages of piano development and manufacture. Piano builder to famous musicians like Richard Strauss, Richard Wagner, Ferruccio Busoni, Arnold Schoenberg, Franz Liszt, Max Reger, Alban Berg and more, Brahms preferred the sound of the Ibach for his piano concertos! A very small output maker known for its innovation in design, Ibach was the first company to make a 'Pianino' or in today's terms, the studio upright 118cm (45" vertical piano). Another important historical fact is that Ibach pioneered the practice of building train tracks to the back of the factory to receive raw materials and ship out finished pianos -- the first factory of any kind to do this! This piano was built in the Schwelm factory near Wuppertal in 1988 and was sent to my store and sold to a fine pianist. F-III models are made in small quantities of only 35 a year to maintain the high attention to detail and quality. Soundboards are highly crowned Carpathian Spruce sourced from the slow growth forests in Romania and have the longest sustain (ring time) in the business. Carpathian Spruce, while similar to Val de Fiemme Spruce from Italy, is actually more sensitive and very expressive in tone. This piano has a highly polished plate and features leather key bushings in the all Renner Action with specially made Renner hammers. Ibach utilizes a wide tail design and scale that creates a more 'orchestral bass' and a singing tone that is huge all the way into the upper 6th octave! This particular instrument has been used in concerts sparingly and has been the 'primo' piano in a two piano concert with a 9' Steinway model D. The concert pianist chose this piano as the first piano because it carried and projected better than the Steinway -- due to its long sustain and rich tone. This piano comes equipped with a Dampp-Chaser Humidity Control System. One of the great pianos available in this country! Description: This is one of the most rare Steinway & Sons model O, 5’10” grands in a special Art Case with double gated legs and stretcher connecting legs and lyre. This is the special (Sketch No. 617a “Sheraton,”) corresponds to a New York Grand Model O Honduras Mahogany, Sketch No. 617a “Sheraton,” completed on December 3, 1910, and shipped to former dealer Cluett & Sons of Albany, New York, on June 5, 1911. From my research, there may have been 2 to 4 made EVER!! This piano was purchased in 1994, completely rebuilt and refinished a new soundboard from Beethoven Pianos in NYC. The owners were professional artists who collected very fine things and moved from Cambridge, NY to Virginia and had to part with the piano. This is an incredible find in a piano from the Golden Age of Steinway. If new, this piano would cost easily over $130,000 if the wood were available which it is not! It is truly a magnificent instrument and a museum piece. One of the best sounding and playing pianos you can find—a true musician’s instrument—and a buy of a lifetime! Description: This rare Louis XV Steinway model O was reputedly owned by the famous composer, Rudolf Friml. Made in New York on November 21, 1918, this piano’s original owner was Louis G. Myers, 102 Waverly Place, NYC. Assuming he sold the piano to the famous Mr. Friml, this instrument was subsequently purchased used by a very prominent industrialist and his wife for their daughter in the mid-1950’s at which time the piano was refinished to its current condition. Replete with famous Steinway features like Diaphramatic Soundboard, Hexagrip Maple Pinblock, and made in the Golden Period of Steinway, this piano was restrung and had new highly-prized Steinway pre-War hammers installed prior to WWII and before the current owner acquired it. This rare model has been completely reconditioned to concert-level performance while retaining the old world sound and quality. This piano had very little playing on the new hammers and is truly a beautiful sounding and playing piano—a true musician’s instrument! This is a true blessing to have and work on and is a bona-fide musician’s piano with supreme musicality, furniture and provenance!! Beyond Rare! Description: This rare and unique old Style 3, 7’2” Grand is a true working Victorian Steinway Grand made in Long Island City, NY in 1877. Rebuilt in the past 10 years, it received new strings, oversize tuning pins, new Steinway hammers and shanks and flanges. Replete with famous Steinway features like the famous Steinway Foundry Plate, Hard-rock Maple Wrest-plank, and made in the Golden Period of Steinway, this rare model has been completely reconditioned to concert-level performance while retaining the old world sound and quality. Because the restoration work was not quite done to my standards, I undertook to restore this instrument without completely rebuilding it yet again -- to provide a truly unique value to the buyer. This piano had NO playing on the new hammers and is truly a beautiful sounding and playing late 19th century Steinway Grand piano—built 9 years before Liszt’s death and 12 years before the genius, C.F. Theodore Steinway’s death! Because of its good but not perfect condition, this piano is selling for less than 35% of what many would ask for this restored model. It has been a true blessing to work on such a very unique piano that hearkens back to a time long gone. Beyond Rare! Description: Kawai is one of the famous Japanese Piano builders who specialize in fine craftsmanship and a warm rich tone in their pianos. Favored by conservatories and teachers around the world, Kawai has created their reputation based on their deep understanding of European piano building and partnerships with famous makers like Ibach and now Steinway. Kawai builds the Boston Pianos for Steinway and this endorsement should say enough about their quality of manufacture. This piano was manufactured new in Aug/Sept.1980 and was made in the Hammamatsu factory in Japan. The comparable new model is the 7’6” RX-7 that lists for over $75,000. This piano was obviously well-cared for and not heavily played. It is very rare to find a Semi-Concert Grand in such pristine condition and with such large, warm tone! This is a phenomenal value for the serious player or for a concert hall. Nothing compares with this at this price – ANYWHERE!!!! Finish: Ebony Satin in Lacquer Finish. Description: Famous for their dominance in the American Piano market, Baldwin has been the #1 selling American piano through the late 90’s. This piano, made in Trumann, AK in the Fall of 1990, is in immaculate condition having had moderate use. This piano purchased new in 1991 by local college from Clark Music--special ordered fitted with the German Renner Action. For many years, Baldwin Artist Grands, the upper line of Baldwin, have been renowned as a very sturdy and sought after piano for school and institutional use. Known for its warm sound, Baldwin 7’ SF-10 Artist Grands have very large tone and were considered by many to be a real competitor to the Steinway 7’ model B Grand! Rich and sonorous, it has a huge bass and very beautiful treble with a buttery smooth, responsive action. This Grand incorporates Baldwin features like the Accu-just hitch pins, Synchro-tone bass strings, Baldwin plate mounting system and more. It has been completely reconditioned including action regulated and hammers voiced in the German manner. A Rare Find for a High Performance Grand that can be equally at home on a concert stage in a small/medium sized Hall or a home studio! Description: Kimball, America’s Home Piano Company, generally made pianos that had nice cabinets but were fair to poor musically. Kimball Piano & Organ Company was purchased in the 1959 by the Jasper American Corporation who were the largest office furniture manufacturer in the world and produced pianos in French Lick, IN and West Baden, IN. In 1966, the Habig family, owners of Jasper American, purchased the legendary Bosendorfer Company of Vienna and later, Herrburger Brooks of Long Eaton, England – noted manufacturer of piano actions and hammers. In the mid 1980's, Kimball created the Viennese Edition and then later, the Viennese Classic as a joint design venture with Bosendorfer. Utilizing many Bosendorfer design features and ideas, they created a line that was compete as a performance piano with Yamaha, Kawai and others; butsadly, themediocre execution of the finer details of both tonal and action regulation and other matters yielded only a somewhat better Kimball Grand than their regular Kimball product although was capable of much more. This piano was built and purchased new in 1994 from Circle Music by a university professor who played well but could not afford a Steinway. We did extensive work to rectify many issuesincluding manufacturing a key stop rail that was NEVER even installed! This piano received total refurbishing and everything was done to realize the Austrian design of Bosendorfer latent within the piano. After work was done, this piano has far exceeded our expectations and is very much a Bosendorfer style instrument which is actually bigger sounding due to a maple rim instead of the Bosendorfer spruce rim. It is a performer's piano and clearly is competitive with pianos costing 7 times more!! Unbelievable value that is RARE!! Description: This rare Louis XV Steinway model O was reputedly owned by the famous composer, Rudolf Friml. Made in New York on November 21, 1918, this piano's original owner was Louis G. Myers, 102 Waverly Place, NYC. Assuming he sold the piano to the famous Mr. Friml, operetta and movie composer; this instrument was subsequently purchased by a very prominent industrialist and his wife for their daughter in the mid-1950's at which time the piano was refinished to its current look. Replete with famous Steinway features like Diaphramatic Soundboard, Hexagrip Maple Pinblock, and mid in the Golden Period of Steinway, this piano was restrung and had new highly-prized pre-war hammers installed prior WWII and before the current owner acquired it. This rare model has been completely reconditioned to concert-level performance while retaining the old-world sound and quality. This piano had very little playing on the new hammers and is a truly beautifully sounding and playing piano --a true musician's instrument! It is such a rare item to retain the old sweet, singing Steinway tone of yesteryear and have a bona-fide heirloom with supreme musicality, furniture and provenance. This piano comes with a letter of provenance from Steinway & Sons and is truly one of the most unique items we ever have had in our shop! Grand, Steinway, Studio Grand 5'10"-64"
Description: This piano is from the acknowledged Golden Period of Steinway New York and was built there in the Spring of 1913. This instrument was purchased rebuilt at Music Lovers Shoppe in Rochester, N.Y. in the 1980’s. The piano was restrung, and refinished in an open pore lacquer satin finish. This piano has the desirable pre-War hammers that have that wonderful, rich tone! This piano has a large range and produces sound more like its larger brother the 5’ 10” model L. While this was not the most elaborate rebuild, we created a wonderful example of pre-WarSteinway magic while being able to offer this piano at an incredibly LOW price – easily 45% less than a typical price for a similar rebuild! Description: Many musicians prefer the broad singing tone of the Boston built Mason and Hamlin over the Steinway. This Grand Piano was built in the famous Boston factory in mid 1928 and is the example of Mason & Hamlin’s golden age—one of the last of the great Boston Mason & Hamlins!! After the factory was moved in late ‘20’s, Mason & Hamlin lost a great degree of its value due to increasingly poorer quality of execution . This piano was kept by a older woman piano teacher who lived alone. She adored the instrument and her 2 cats. When she died, the contents of her house were disposed of through an estate sale. We opted to accept the condition of the cabinet, acceptable but noticeably used, and the condition of the superstructure (soundboard, pinblock, strings, etc.) and chose to recondition the action and reset tuning pins to insure tuning stability. The original hammers were resurfaced and voiced and the action was reconditioned and regulated. This piano is truly a musician’s piano and is larger in tone than any comparable Steinway. We havechosen not to completely rebuild this piano to offer a truly remarkable value price. Grand, Mason & Hamlin, Parlor Grand 5'5"-5'9"
Description: From a high-end estate in Glens Falls, NY that had two matching Steinways, this piano is an example of the best Steinway has to offer in this size piano. Made in New York, in the Fall of 1963, this instrument was exceptionally cared for in that the original soundboard and action are immaculate. The piano is totally original, hardly played, and has been completely reconditioned to concert-level performance. Replete with famous Steinway features like Diaphramatic Soundboard, Hexagrip Maple Pinblock, Accelerated action with Permafree bushings, this piano was made to last easily for 100 years if well maintained. The beautiful finish has been polished to a high gloss. This piano has a huge tone and produces sound more like its larger brother -- the 5'7" model M. This is a musician's piano in a small size with a big voice that will grace any living room anywhere. This is the best model S Baby Grand I have ever seen!!!! Description: Yamaha Pianos, made in Japan, are very well designed instruments and are internationally recognized as world class pianos of exceptional value. This model was made for the professional market as a high quality performance instrument. Built in the Hamamatsu factory in the Spring of 1982, it was purchased later that year by a dealer. Bought from the same dealer in Oregon who went bankrupt, this piano was part of his large unused rental inventory. It appears to be a Metropolitan Opera Loan Piano where Yamaha lends instrument for a short period for promotional reasons. The piano is in impeccable condition and appears to have been hardly used. Having a huge tone, very even touch and sound, we only had to regulate the action and voice the piano in the German manner as it needed little else. This piano is built better than its newer Yamaha cousins due to a less brighter and more traditional European sound than the newer Yamaha Grands. Also, it is unusual to find such a fine performance instrument that has not been heavily used -- clearly an unusual value and pedigree! Description: Kawai is one of the famous Japanese Piano builders who specialize in fine craftmanship and a warm rich tone in their pianos. Favored by conservatories and teachers around the world, Kawai has created their reputation based on their deep understanding of European piano building and partnerships with famous makers like Ibach and now Steinway. Kawai builds the Boston Pianos for Steinway and this endorsement should say enough about their quality of manufacture. This piano was manufactured new late in 1983 and was made in the Hammamatsu factory in Japan. The comparable new model is the 5’11” GX-2 that lists for almost $31,395. This piano was extremely well-cared for and was owned by very wealthy people who NEVER played the piano.The piano is virtually like new with a very warm, rich tone especially after the German voicing we performed. This is an uncommon find to get European tone at Japanese price! Very Unique!! Description: Kawai is one of the famous Japanese Piano builders who specialize in fine craftsmanship and a warm rich tone in their pianos. Favored by conservatories and teachers around the world, Kawai has created their reputation based on their deep understanding of European piano building and partnerships with famous makers like Ibach and now Steinway. Kawai builds the Boston Pianos for Steinway and this endorsement should say enough about their quality of manufacture. This piano was manufactured new in mid-1968 and was made in the Hamamatsu factory in Japan. The comparable new model is the 5’10” GX-2 that lists for over $31,000. 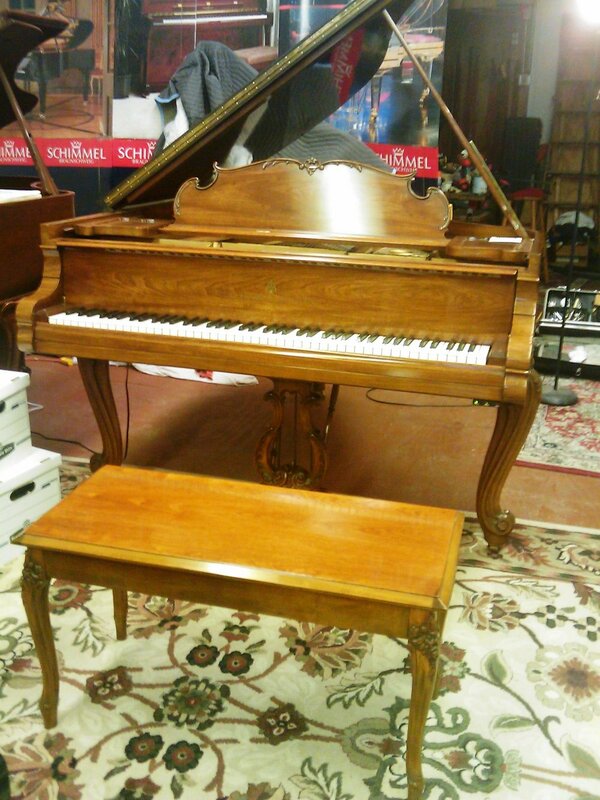 This piano was extremely well-cared for and was owned by a local executive family. Purchased used in Pleasanton, CA over 25 years ago, this piano spent its last 18 years in this area. It is the predecessor to the famous KG-2 model although this model was much stronger and more “European” in tone. Note the huge warm sound. A fantastic instrument for the serious musician. Description: Albert Weber was one of America’s most respected piano builders. Preferred by Paderewski and others, Weber pianos were always highly praised and deep rich musical instruments. Weber, like Knabe, Chickering and Mason & Hamlin was bought out in the late ‘20’s by Aeolian American Corporation. This piano was manufactured early in 1928 and was probably made in East Rochester, NY along with its high-end cousins, Mason & Hamlin, Knabe and Chickering. This piano represents a level of craftsmanship that is almost extinct and truly very rare today. The special French Provincial case in Black Walnut featured hand carved legs and moldings around the case. Black Walnut is now virtually unavailable in any quantity and is very rare! This piano features the original special hammers of German felt that have a remarkable sound and has been conserved to keep the original tone quality. This piano was rebuilt in the 1970’s and had new hammers, strings and more! This is a true museum piece that will adorn any living room with grace and charm. SUPER SUPER RARE and UNIQUE! Grand, Weber, Art Case, Baby Grand 4'5"-5'4"
Finish: Inlaid Italian Florentine Double Leg in American Walnut Lacquer Finish. Description: Albert Weber was one of America’s most respected piano builders. Preferred by Paderewski and others, Weber pianos were always highly praised and deep rich musical instruments. Weber, like Knabe, Chickering and Mason & Hamlin was bought out in the late ‘20’s by Aeolian American Corporation. This piano was manufactured early in 1930 and was probably made in East Rochester, NY along with its high-end cousins, Mason & Hamlin, Knabe and Chickering. This piano represents a level of craftsmanship that is almost extinct and truly very rare today. The special art case furniture design with the double turned gated legs in an Italian Florentine style with floral inlays on all legs and the music rack with exotic woods like quilted walnut, mahogany, rosewood, black walnut and more! There is also a medallion above the treble leg of quilted walnut and more that is extraordinary! This piano features the original special hammers of German felt that have a remarkable sound and has been conserved to keep the original tone quality. This piano was rebuilt in the 1980’s and the tuning pins are like new tight! This is a true museum piece that will adorn any living room with grace and charm. SUPER SUPER RARE and UNIQUE! Description: Yamaha Pianos, made in Japan, are very well designed instruments and present a very good value in today’s market. This model was made for the home market as a quality 5’3” grand piano for the average buyer. This piano was built in the Hamamatsu factory in mid 1978 and was purchased new at Clark Music in Latham, NY by an executive family. The owner took very good care of the piano and purchased the piano for their boys – neither of whom played much. It is an uncommon value due to the fact it is virtually new and in immaculate condition. This piano is the well respected ‘J’ scale that is actually highly desired. This piano performs much like the current C1 but has a depth and expression of a fine small German grand due to the German voicing and concert regulation performed. The piano is built better than its newer Yamaha cousins now manufactured in the factory in Indonesia. Most used Japanese pianos available are ‘grey market’ instruments that are made for the Pacific Rim market and not seasoned for North America. But this piano is made for North America and its wood is seasoned for our climate – insuring its durability. A rare find in this immaculate condition!! Grand, Yamaha, Ebony, Baby Grand 4'5"-5'4"
Description: Famous for their dominance in today’s piano market, Samick is the #1 selling brand worldwide. Known for incorporating German design and high quality parts in quality affordable pianos, Samick recently purchased Bechstein, Sohmer, Knabe and now 49% of Steinway and other brands as well. This piano, made in Korea under the Hyundai name, inmid 1990, is virtually identical to the Samick SG-155 and is in immaculate condition having had almost no use. It was owned by an executive family and resided proudly in their formal living room in Wynantskill. Designed by the famous German Piano Designer, Klaus Fenner, this piano features: Solid Sitka Spruce Soundboard, Full-size Direct Blow Action of hard rock maple, German Röslau Strings, German Delignit Pinblock, Royal George Hammers & German Scale Design. This is a well made model in the German low tension scale design and after the concert regulation and voicing we have done, this piano sounds and plays more like a German piano than an Asian piano. This is a magnificent value for little cost -- you won't believe your ears! Grand, Hyundai, Ebony, Baby Grand 4'5"-5'4"
Description: Premier Piano Company was one of the many fine upper mid-range piano manufacturers in the early 1900’s. This piano is evident of the fine design and quality of manufacture. With features like a full perimeter plate, normally found in high-end instruments like Mason & Hamlin, the tone of this piano is superior for its size. Manufactured in late 1925, this wonderful instrument was well cared for and has original hammers, strings and soundboard. The finish is in remarkable condition and the piano action has been regulated and voiced in the German tradition. This is another fine value as this piano has such high end qualities that cannot be duplicated today without tremendous expense for its small size. Grand, Premier, Baby Grand 4'5"-5'4"
The Samick SDP200G Digital Ensemble Grand has 36 onboard sounds and 36 auto rhythms that can be played with one finger accompaniment or chorded. You can enjoy this 88 key digital grand as a beginner or a professional! This Grand was originally $8,995 new and yet we are offering this at an unbelievable blow out to the right person! "Thank you for the beautiful Steinway that you prepared for me. It was the perfect piano for the program I did- absolutely first- rate. I didn't have to alter my technique to play it and was able to get so many colors- many thanks!"